Equinox Birdbath Fountain is 20.5 inches long x 20.5 inches wide x 30.25 inches high and weighs 134 pounds. No plumbing needed-No additional water source. All Campania International pieces are stained to order. This process takes 10-14 business days to complete and to prepare for safe shipment. 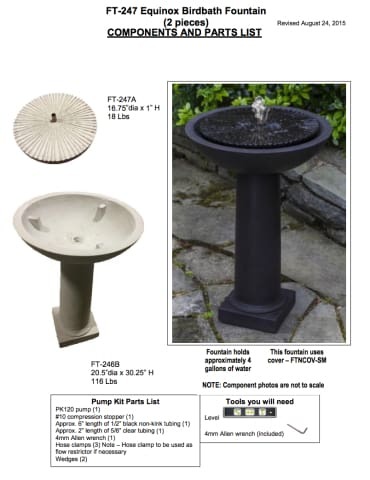 Order the Campania International Equinox Birdbath Fountain with free curbside delivery to your home from TheGardenGates.com today.